Many people believe most midwives are hospital based. However we appreciate many of you are based in the community providing services in GP practices, people’s homes and even children’s centres. Community based midwifes have a broader choice of uniform but it’s important whatever you choose to wear inspires confidence and trust. It’s a role carrying great responsibility, especially as midwives are increasingly not hospital based. Our Midwives Dresses are flattering and stylish. Choose from plain or striped fabrics in a ‘Step In’ Panelled design. These are all cut in an easy to wear A-line style. The length is 107 cm and sizes are available in 8 to 28. Popular options in the plain fabric range include Step In Panelled Female Dress - Sailor Navy, Step In Panelled Female Dress – Royal and Step In Panelled Female Dress – Bottle. Striped colour options include Lilac, Blue, Navy and Grey. All in the same great cut! All ourStep In Panelled Dresses have contrast piping and 4 pockets with one pocket incorporating a waterproof pen pocket. A logo or name can be added to any dress and there is no minimum order. Of course not all midwives wear dresses or some prefer to alternate with a tunic and trousers. Our Midwives Tunics come in plain solid or stripe fabrics in sizes 8 to 28. They have 4 pockets plus a waterproof pen pocket and back vents with action pleats. Popular choices among the solid colours include Female Tunic White and Female Tunic – Hospital but of course there are lots of alternatives to choose from! 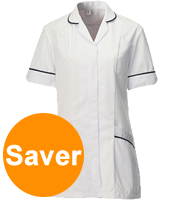 Note that we also offer a Saver Pack of 10 Female Tunics – White. You can mix and match sizes and add your name or logo. Just upload when ordering. Our striped midwives tunics are designed to the same specification and come in a choice of Grey, Aqua, Lilac, Blue or Navy stripes.